The resort is situated on 20 acres of fruit groves consisting of mango, guava, guanabana, papaya, lemon, orange, star fruit, cashew, banana, and grapefruit trees. 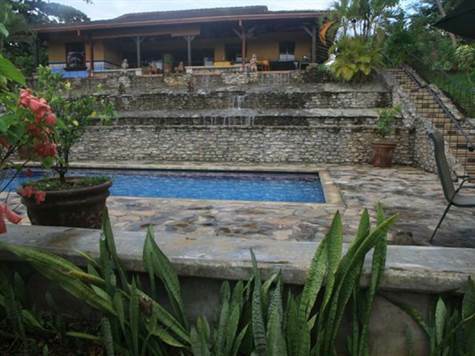 The resort is perfectly located on the main highway near all tourist destinations in Costa Rica’s Central Pacific area. The resort consists of 7 completed villas (5 different styles) ranging from 1430 sq ft to 2160 sq ft. Five of these villas have two bedrooms and two bathrooms and two villas have one bedroom one bathroom. There are three additional villas that have yet to be completed. These three villas consist of two, two bedrooms and two bathrooms and one, one bedroom and one bathroom. The three additional villas are 40% to 88% completed. Talavera bathroom tile and Kohler fixtures have already been purchased to complete these villas. No expense was spared on the construction of these villas. The completed villas are beautifully decorated in a Mediterranean/Mexican style. Pre Columbian art adorns the walls. Imported handmade Talavera tiles and Kohler fixtures create a relaxing experience in the bathrooms. The full kitchens have stainless steel Frigidaire appliances, granite countertops and handmade furniture is found throughout the villas. The resort has its own private well with freshly filtered well water running to all of the villas. The resort lobby contains a restaurant/bar, business center, and gym. The resort also has a home that can be used as an employee area including a separate area for a live in manager. For the guests enjoyment the resort also includes a variety of activities. There is a large pool and a fishing pond stocked with tilapia. Guests may wander the property and enjoy our beautifully landscaped paths with local vegetation and Pre Columbian statues. Guests are frequently amazed at the amount of wildlife that is found here on the property. A large group of mantled howler monkey lives on the property as well as; iguanas, butterflies, turtles, red tailed squirrels, frogs, forest rabbits and a variety tropical dry forest birds.